The leaves have all changed to brilliant reds and gold here on the Bay of Fundy. We are all hurrying to bring in the last of the winter's wood, and readying the farm for winter. We have had the first and second killing frost, so even the sunniest of days carry a chill. Although I am not a fan of the cold, I do love cooking for it. My family may spend 4 or 5 hours at a time outside, so they need warm, comforting foods to fill them and warm them up. It's much more fun to make stick to your ribs type meals, so chili finds it's way on the menu quite often for the next few months. 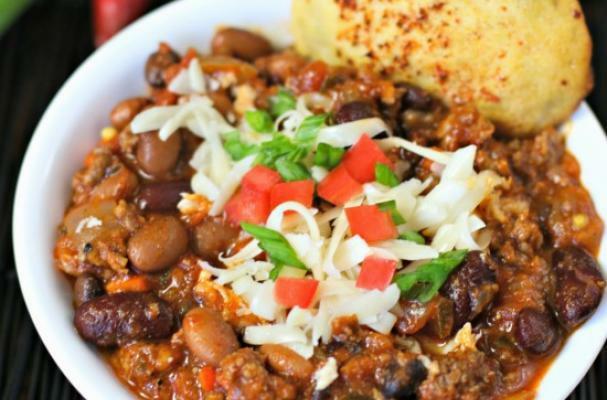 I was thrilled to see that Foodista contributor, Culinary Envy, shared her recipe for this light but filling turkey chili. I made it tonight in my pressure cooker and it was waiting for us when we all came in for dinner. Divine! 1 Heat the olive oil in a Dutch oven or large wide pot over medium-high heat. Add the celery, onion, poblano pepper, carrots, ½ teaspoon salt and pepper. Cook, stirring occasionally, until the vegetables have softened, about 8 minutes. Add the garlic powder, onion powder, chili powder, cumin, garlic, tomato paste, sugar and cook, stirring, about 2 minutes. Remove to a small bowl and set aside. 2 Using the same pan, add the turkey, turkey sausage, ½ teaspoon salt and cook, breaking up any clumps with a wooden spoon, until brown, about 8 minutes.